You’re such a doodle…cheesy at it’s best!! Me? Cheesy? I have no idea what you’re talking about! Mmm cheese puffs! You got this Wisconsin girl’s attention! I can only imagine your enthusiasm if it had been National Cheese Curds Day! Yikes… Seriously, who eats that stuff? If it cant be dipped, it isn’t snack food. I hate the way the orange powder floats on dip…give me a chip any day over those things. We didn’t have the puffy doodles for YEARS after you guys. We had hard crispy Cheezies. Then the puffy things came along and we all looked at them like they were some bizzaro foreign object. The Lesson learned is, Canadians can’t think of original crap to eat, we are copy cats. Au contraire, E.T. – Cheese Doodles are awesome! 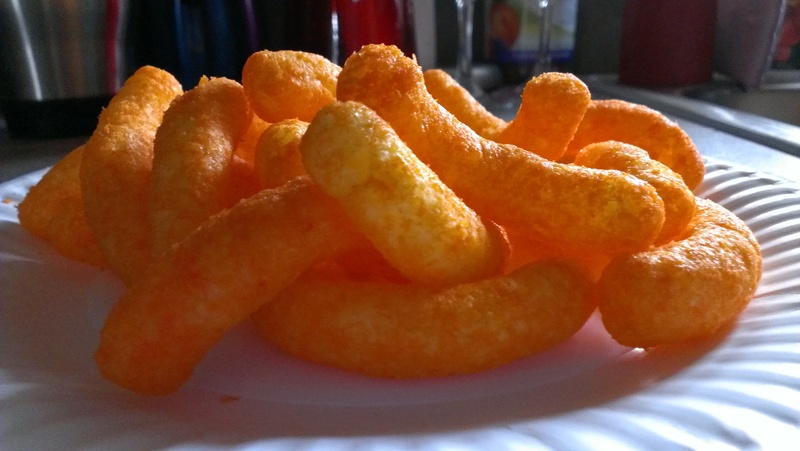 When I was married, the ex preferred crunchy Cheetos but I always liked the puffy ones. Nowadays, I enjoy them both. By the way, quit copying us already!